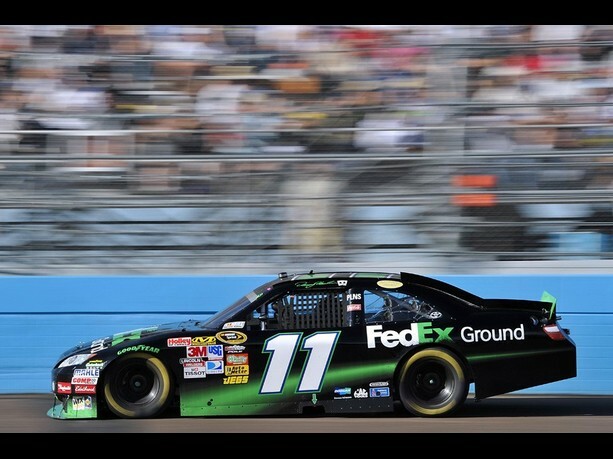 Denny Hamlin and the #11 FedEx Racing looked destined to visit Victory Lane and increase their lead at the top of the Chase for the Sprint Cup standings Sunday at Phoenix International Speedway during a truly dominating run but, in the end, fuel mileage undid their distinct advantage and relegated them to a bittersweet 12th-place finish. Carl Edwards led five times for 93 laps on the way to his first win of the 2010 season. Edwards passed Hamlin on lap 266 and stretched his fuel load to make the end. Ryan Newman, Joey Logano, Greg Biffle and Jimmie Johnson filled out the top five while Logano and Hamlin’s Joe Gibbs Racing teammate, Kyle Busch, finished 13th. By virtue of his fifth-place finish, Johnson closes the gap between himself and Hamlin at the top of the Chase for the Sprint Cup standings to 15 points through nine races. Hamlin collected bonus points for both leading a lap, and for leading a race-high 190 laps on the day to maintain his Chase lead heading to Homestead-Miami Speedway next weekend. Hamlin rolled off from the 17h spot on the grid Sunday but it was clear from the start that he had the car to beat and would run up front eventually. That played out almost immediately as Hamlin charged forward, guiding the #11 FedEx Express Toyota into the top-ten by lap nine, then into fifth place with a pass of his teammate Kyle Busch on lap 28. When the second caution of the day flew on lap 60, Hamlin ran in second place and after visiting pit road for four tires and fuel, restarted alongside Edwards in the front row. Hamlin took the fight to Edwards immediately after the restart, pulling ahead to lead for the first time on the afternoon, and he would hold the advantage until the caution flag flew again on lap 100. Hamlin turned onto pit road for four tires, fuel and a track bar adjustment intended to help with rear grip. He restarted second on lap 105. Once again Hamlin used the restart to push the FedEx Toyota into the lead and once again he pulled away in the clean air up front. He led until he reached his fuel window on lap 171 and pulled the #11 Camry onto pit road once again. Crew Chief Mike Ford ordered up another track bar adjustment to go with a wedge adjustment, four tires and fuel. 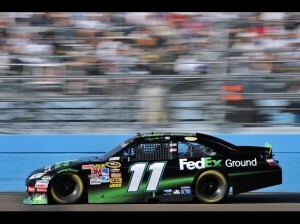 The FedEx crew worked quickly and Hamlin reclaimed the lead once back up to speed. When the caution flag came out on lap 223, Hamlin again asked for help with his drive through the center of the turn and Ford called for another track bar adjustment. Hamlin restarted second on lap 228 but again he took advantage of the restart to claim the lead. Staying out through a lap 234 caution, Hamlin added to his lap total before Edwards pulled to his bumper on lap 260 to start five laps of close racing between the two drivers at the front of the field. Edwards eventually moved inside of Hamlin on lap 265 but every indication was that the entire field would need to make one last stop for fuel. Hamlin’s stop came on lap 298 when he turned onto pit road and the FedEx team changed out right side tires and added fuel to the car. Hamlin cycled through in 16th place and fully expected to regain – or challenge for – the lead once everyone made their stops but that cycling never occurred. The Chase for the Sprint Cup continues next weekend when the teams visit South Florida and the 1.5-mile Homestead-Miami Speedway.